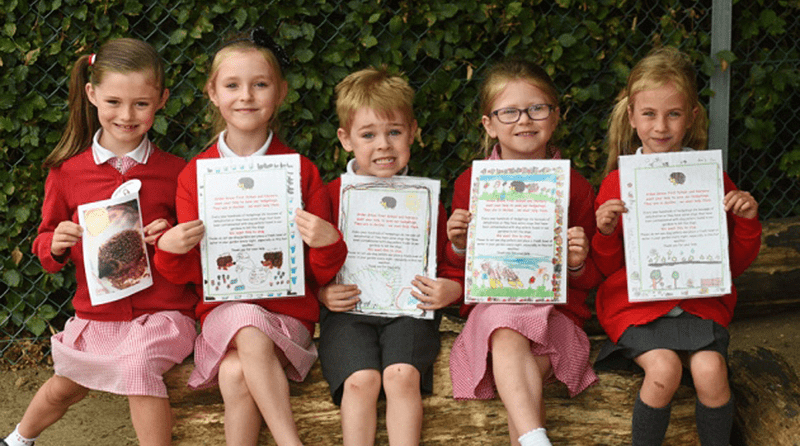 Youngsters at Arden Grove Infant and Nursery School, Hellesdon, have been using their creative skills to raise awareness of how hedgehogs have been affected by the summer heat. For some, the recent heatwave has been a blessing, but for hedgehogs, the dry and hot weather has unfortunately created many barriers for the small animals to overcome. Long periods of hot weather can dry and harden the ground, making it difficult for hedgehogs to dig for food or find pools of water to drink. Nursery nurse Lynda Clarkson, who organised for the children to visit wildlife charity Hodmedod’s Hedgehog Support, said the youngsters were saddened to learn about the hedgehogs’ plight but were excited to raise more awareness. After encouraging each of the children to create a poster, Mrs Clarkson said: “The response was amazing. We were flooded with posters and had massive task picking the best. “Whilst this was happening, a pupil in year two had rescued a hedgehog on the road, taken it home, fed and watered it and then released it back into the wild, fully recovered. Paula Pithers from Hodmedod’s Hedgehog Support said: “I think the children are brilliant. They have really taken it on board and they’re really helping the hedgehogs – we’ve got our first hedgehog heroes at the school.